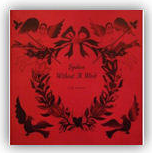 In 1983, appliqué icon Elly Sienkiewicz published a little square 12½” book with a red cover entitled Spoken Without a Word. The photo-less, 68-page black-and-white book, which brought Baltimore Album block patterns and an infectious theory about symbolism to the modern quilter, quickly went through five printings and arguably served as a catalyst for the Baltimore revival that is still going strong. Today, copies of the original “Red Book” can be found listed on the internet for hundreds of dollars. Exciting news! A little bird told me that Elly is preparing a new edition of this important classic! 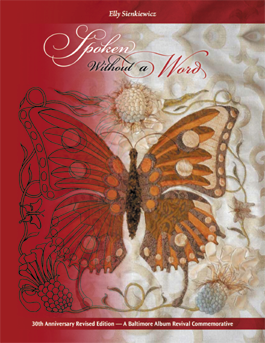 Spoken Without a Word: A Lexicon of Symbols with 24 Faithfully Reproduced Patterns from Classic Baltimore Quilts, 30th Anniversary Commemorative Edition, is coming out this fall! The original book’s signature red color is threaded throughout the black-and-white engraving-like details of the new edition, now revised and reformatted to 8½’ x 11″ and 128 pages. The familiar original text remains intact, and the patterns remain untouched. 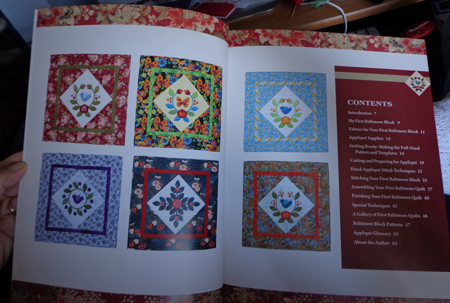 What’s new and additional are glorious photos of newly made blocks, settings, and wall quilts, and a new foreword and afterword from Elly. 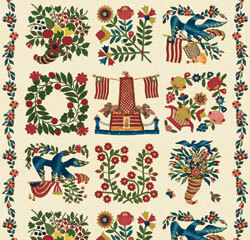 The new edition is available for pre-order on Elly’s website, Appliqué With Elly. Baltimore’s County Cousins, I detected the Baltimore longing in many of the comments. I’ve always wanted to do a Baltimore Album but frankly they do intimidate me. 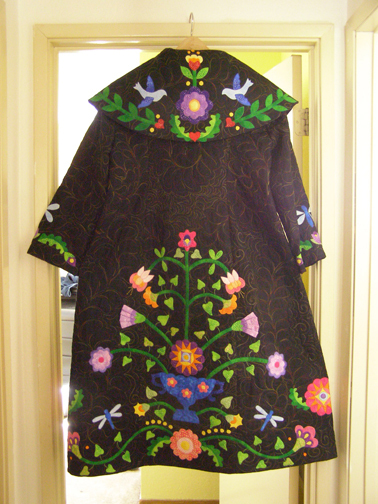 I love applique but I’m not up for the more complicated patterns, yet. Haven’t done a Baltimore quilt yet, but would love to. Oh! 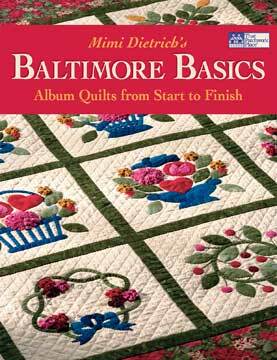 I love baltimore album quilts but have never made one. One of the things that has kept me from making my own Baltimore album quilt is the feeling that I need to wear formal attire! These wistful reflections made it clear which book I needed to pull out of the cupboard next. May I present, courtesy of Martingale, Mimi Dietrich’s Baltimore Blocks for Beginners. Subtitled “A Step-by-Step Guide,” this book is designed to to be a gentle and compelling introduction to the Baltimore genre that will get you started on your way at last! Mimi, who lives in Baltimore, has been teaching Baltimore Album appliqué classes for over 30 years. 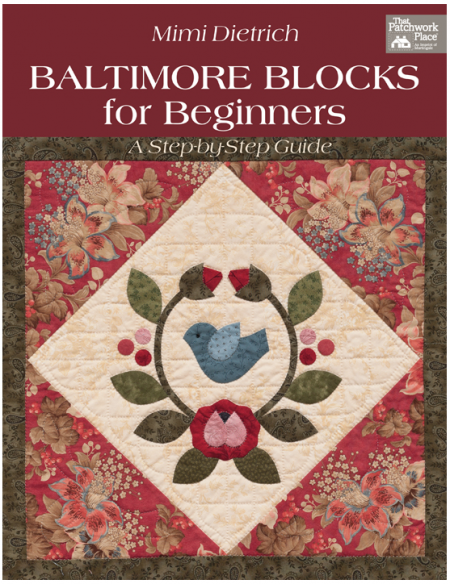 Her most basic class is called, “My First Baltimore Block,” and this book is that class! It will take you slowly through all the techniques and elements of a basic block. There’s also a circle wreath and a crossed leaves design, as well as a gallery of different colorways to provide inspiration. I love what Mimi says in the introduction: “There are many techniques, tools, and patterns for appliqué. All of these are correct, as long as you are comfortable and pleased with the results.” Yes! That’s what I believe too. Mimi presents her own favorite methods for successful beginnings. 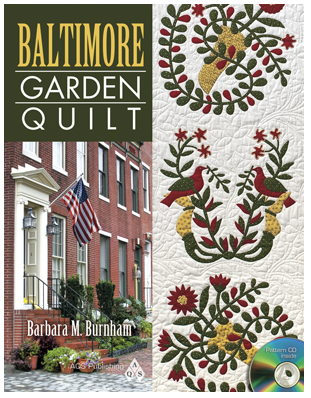 The information covers fabrics, appliqué supplies, preparing the pattern and templates, cutting and preparing the shapes, and illustrated information on hand-appliqué stitch techniques, followed by step-by-step instructions for making your first Baltimore Album block. Are you starting to feel like you can do it? You can!!! If you’d like to win this book, please leave a comment here on this post before 7:00 p.m. California time on Friday, April 5. Contest open to U.S. and Canada mailing addresses only. Do not click “reply” to your email feed. That will only send me an email and not enter you in the draw. Click over to the blog on the internet and leave your comment at the bottom of the post. Congratulations to Kathleen Connors, the winner of Flowers All Around! Kathleen, enjoy the book! My thanks to everyone who entered the drawing. I appreciate you reading my blog and being a fellow appliqué enthusiast. 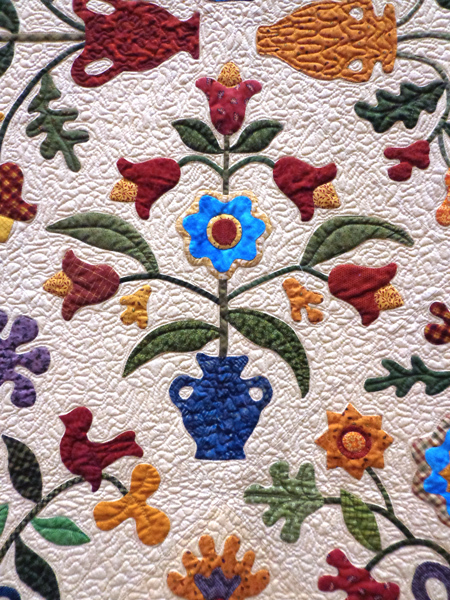 Over at The Quilt Show‘s Daily Blog, they’ve posted a slide show of a beautiful Baltimore Album exhibit that was displayed at the International Quilt Festival in Houston last fall. 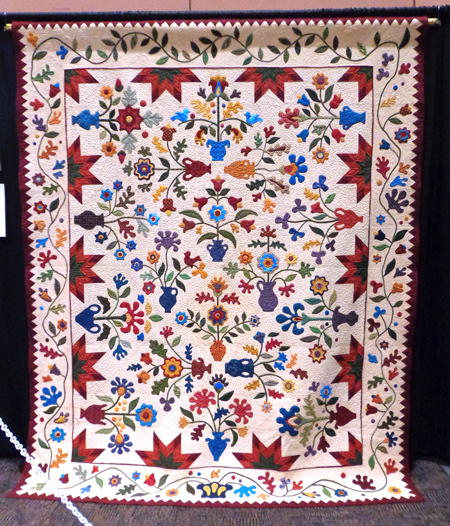 The slide show is available for viewing to all… you don’t have to be a member of The Quilt Show. The link is below. Enjoy! Last summer I wrote about Baltimore on the Prairie. 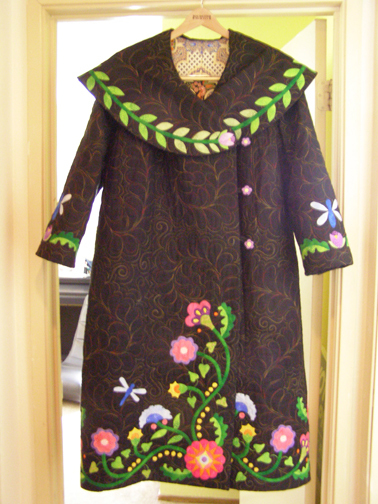 This just in from appliqué designer and teacher Kathy Delaney. Registration is still open! 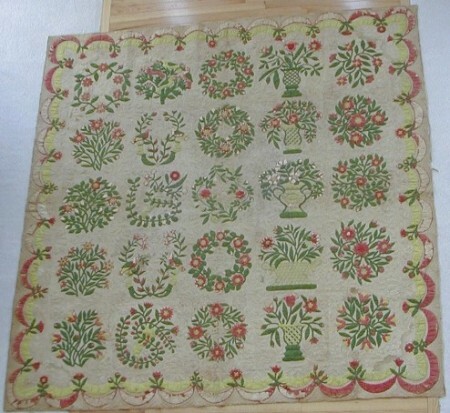 Are you fairly new to appliqué or intimidated by what the “big girls” are doing? You don’t have to be! 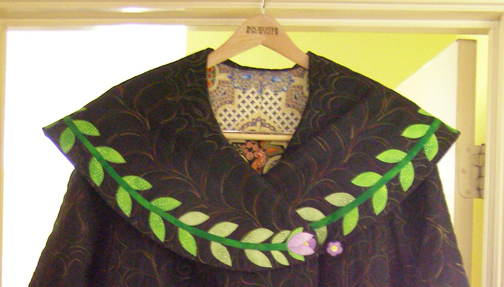 The Baltimore on the Prairie conference has something for all levels of applique enthusiast — from the beginner to the most accomplished. AND the price is extremely right! What better way to learn a new technique or practice what you already know than to spend from Thursday evening to Sunday afternoon with a knowledgeable and talented teacher! This year there are only openings for 100 students and spaces are filling quickly. Check out the Baltimore on the Prairie website for information, registration forms, and class samples. 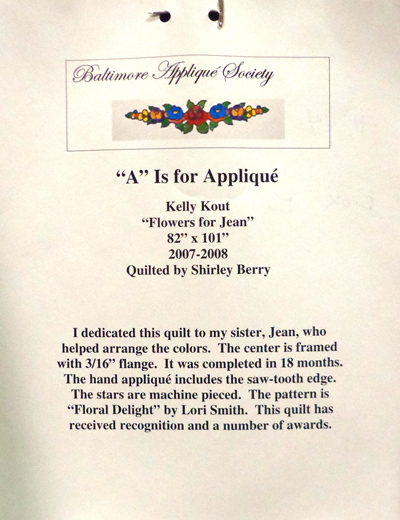 If you’re interested in Baltimore Album type appliqué, then you should visit the website of The Baltimore Appliqué Society. 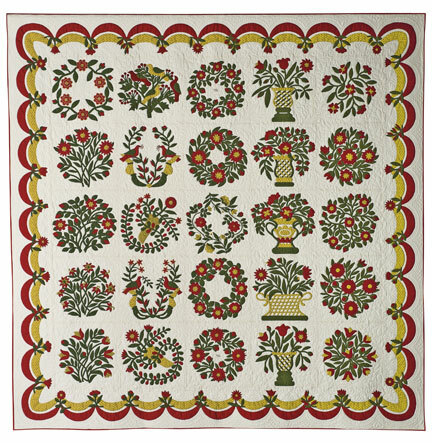 Check out each of the links on the left-hand side of their home page… they’ll take you to photos of exquisite quilts that have great historical significance, and patterns that members of the Society have made for them. Enjoy! I’m a member of The Quilt Show with Alex Anderson and Ricky Tims, described by them as “The World’s First Interactive Video / Web Magazine and Worldwide Online Community for Quilters.” They send me email updates a couple time a week. 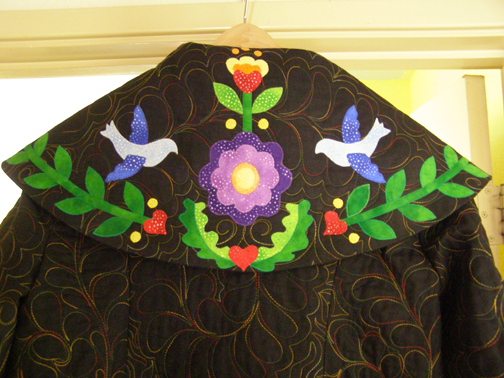 Their latest one announces an upcoming program with venerated appliqué artist Elly Sienkiewicz. Even if you’re not a member, you can click on the “Slideshows” tab at the top of the home page and view behind-the-scenes photos taken during taping by Photo Man Gregory Case. And you’ll enjoy some gorgeous Elly appliqué eye candy! OMG! 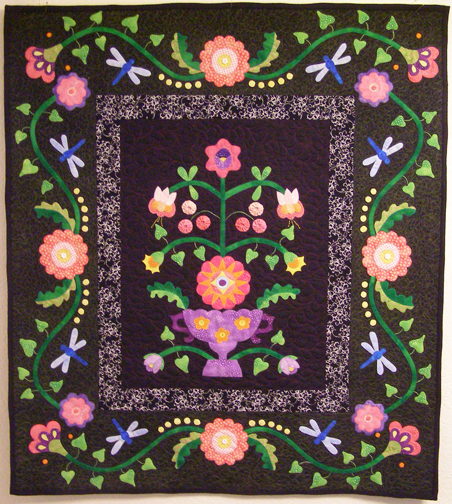 The woman was 67 when she signed up for a BA class and 83 when she designed the beautiful border and hand quilted the whole thing! You go girl! I flagged down the president of the Tokay guild and asked her to send Thelma my way if she was at the show that day. A little while later, Thelma showed up, dressed in a fetching black and white outfit with pearls (as all the guild members in honor of their 25th anniversary) and some really cool tennies, proud as punch of her quilt, and when I made my request she seemed very pleased at the prospect of having her quilt up on a blog, especially since now her friends and relatives back east would be able to see it. 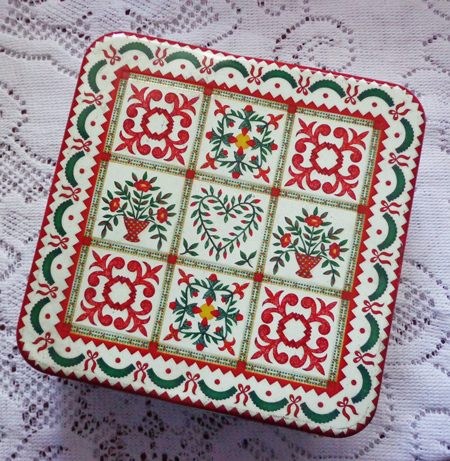 Here are a couple of the gorgeous blocks. Whew, I sure hope I’m as spry, gracious, and productive as Thelma when I’m 83! We got there a mite early, with just enough time to do a little shopping at Eddie’s, then it was upstairs to the meeting room to sup on a tasty light dinner and sip some wine. At 7:15, Eddie introduced Elly, who turned on the slide projector, and POP! the bulb broke. The replacement bulb didn’t fit, so…. no slides. Elly didn’t miss a beat, and just started talking to us about the BA era, about 1843 to 1856, and her research into the many symbols that recur both in the blocks and, curiously, on gravestones. She told us that the women of the time were fluent in the language of symbols, something that has slipped away from us in present times. There were many associations with Methodism, the Masons, and the Oddfellows. Though we missed seeing her slides, the subject was fascinating and it was just so cool to finally meet this grande dame of appliqué. She is one of the nicest ladies you could hope to meet, and has done so much for us quilters in the realm of qppliqué. 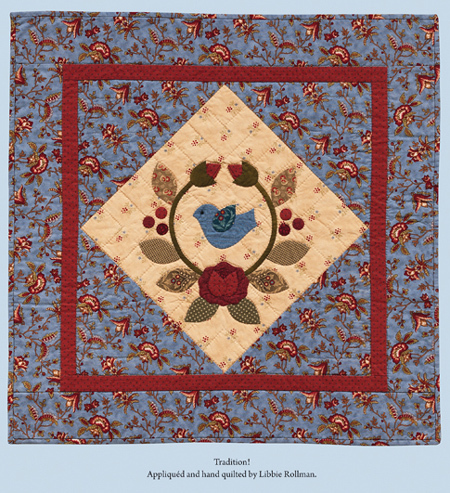 The International Quilt Association puts out a quarterly journal for its members. 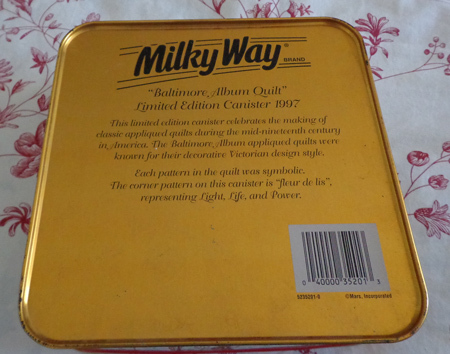 In the latest issue there’s a fabulous article by Rhianna White called Quilting 101: Baltimore Album Quilts. 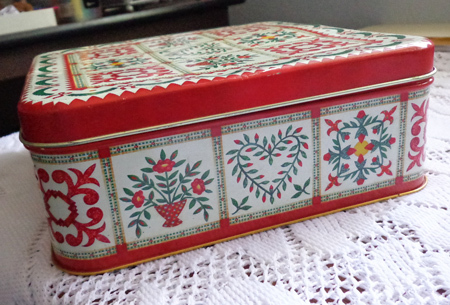 It’s a great lesson in the origin and history of the popular appliqué art form, and if you’re interested in the history of appliqué you’ll love this article. Renowned experts Elly Sienkiewicz and Mimi Dietrich contribute to the information.